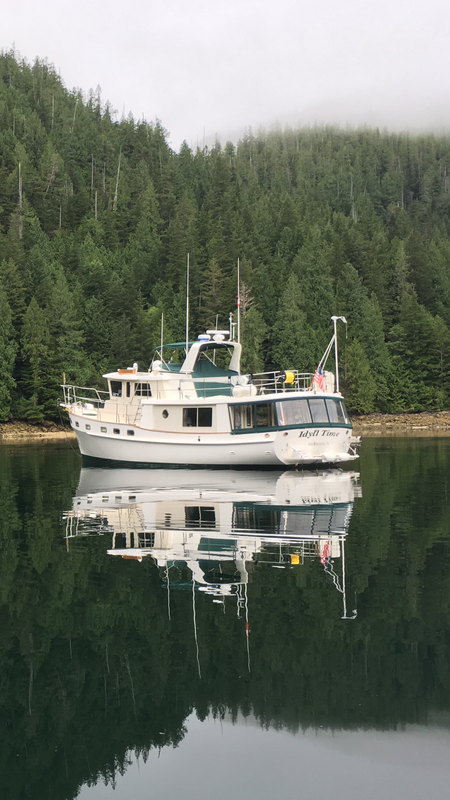 Saying goodby to Pierre’s, we continue our exploration deeper into the Broughton Islands. It is a grey cold day on the water. Puff continues to preform flawlessly and we stay nice and toasty in the pilot house. This was a great addition to Idyll Time. While traveling west around Broughton Island, we see some spouts in the distance. A pod of orcas are heading east. As we pass, I snap several pictures from afar as we did not want to get too close. 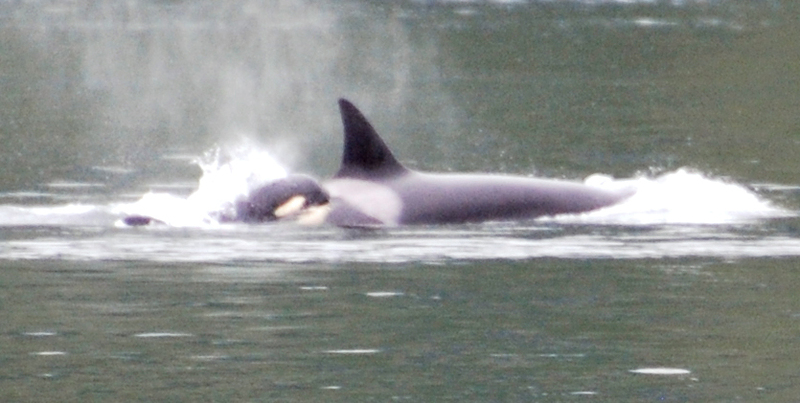 While reviewing them later, we notice a baby orca following close along with her mom. As we reach the end of Grappler Sound, we can see the turbulent water ahead. To reach our anchorage for the evening, we must transit this stretch of waterway. Our guide book had mentioned that their could be strong current through this pass. We just didn’t think it would be this turbulent. There is no reference for this passage in our tide book for when slack would be. We have the current with us so we continue on dodging several whirlpools and boils. Luckily it is a straight shot through and we are soon back in calm waters. Hopefully, we can figure out when slack water occurs before we retrace our route. There are three large yachts in the anchorage upon our arrival. No worries though as this is a huge beautiful Cove with room for many boats. Completely surrounded by high peaks, the water is mirror smooth. We soon have the dinghy down and are on our way to set the crab and prawn traps. 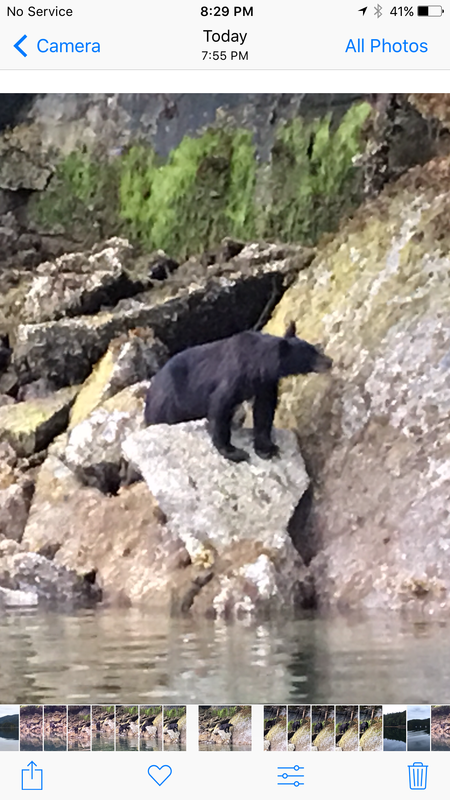 During our evening jaunt around the harbor, we spot a black bear climbing on the rocks in search of his own seafood feast. He doesn’t seem at all weary of our presence. We drift quite close before he meanders into the woods. 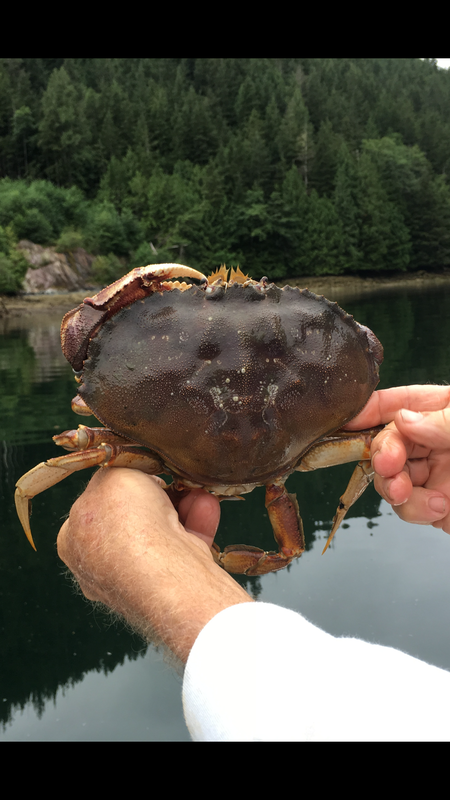 Hauling our crab traps the next morning, we are excited to see two humongous Dungeness crabs in our trap along with many smaller ones. 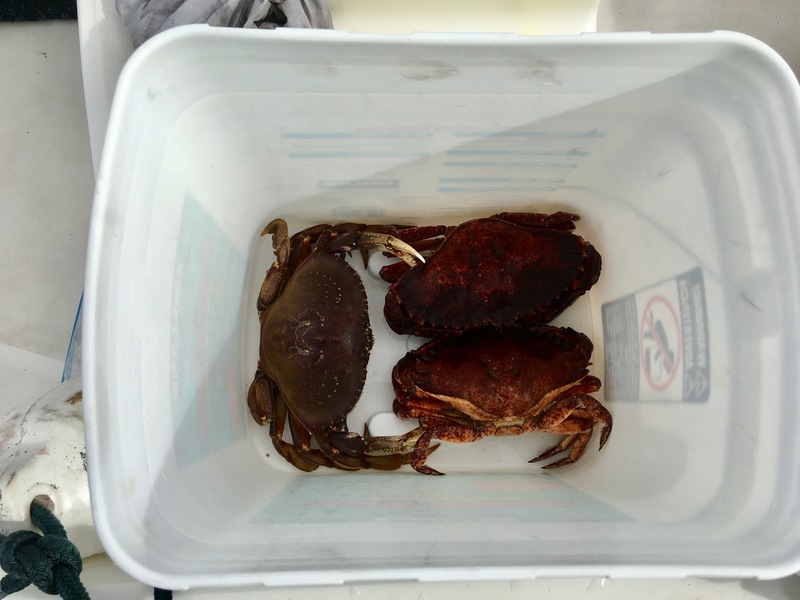 These are the first Dungeness that we have caught. Our excitement is quickly squelched when we find the two large ones are female. You can only keep males. The smaller males are too small to keep. They must be at least 6 ¼ “ across their carapace. This is the farthest north we will travel this year. We are at 50 55’ 28” north latitude about 360 miles south of Ketchikan, Alaska as the crow flys. We will slowly work our way back to Sidney, B.C. from here. We leave Turnbull Cove trying to time our exit through the swift currents at slack. Looks like our calculation was not correct. As we reach the narrow passage, we see the water raging once again. This time the current is against us but we continue slowly working our way through the whirlpools and back eddies. We get through safely but would much prefer to have gone through at slack tide. Whitewater boating in our Krogen just seems wrong. We need to do more research on this passage to figure out when slack occurs. Our anchorage is a short six miles away in Claydon Bay. Crabbing is reportedly good here and there is a 240 ft. deep spot just outside the anchorage where will will try for some more prawns. 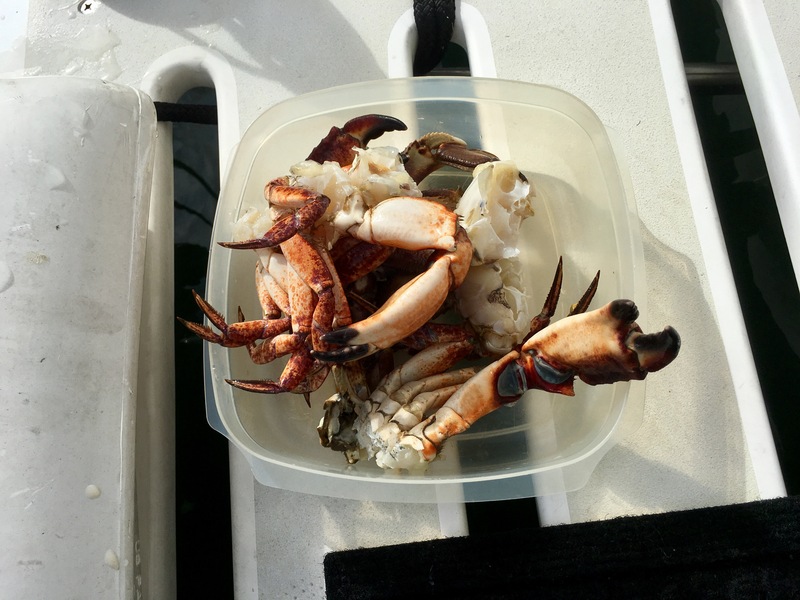 Crabbing and prawning are kind of like buying a lottery ticket. Each time we put the traps out we are hopeful that this will be the big catch. Of course we never do hit the jackpot. Every so often we pull up the traps happy to find a token bounty. It is kind of like winning $2 each time you spend $10 on the lottery. You get just enough to make you keep trying. Pulling our shrimp trap we again have about 14 shrimp. We did however improved over 100% on the crabbing. 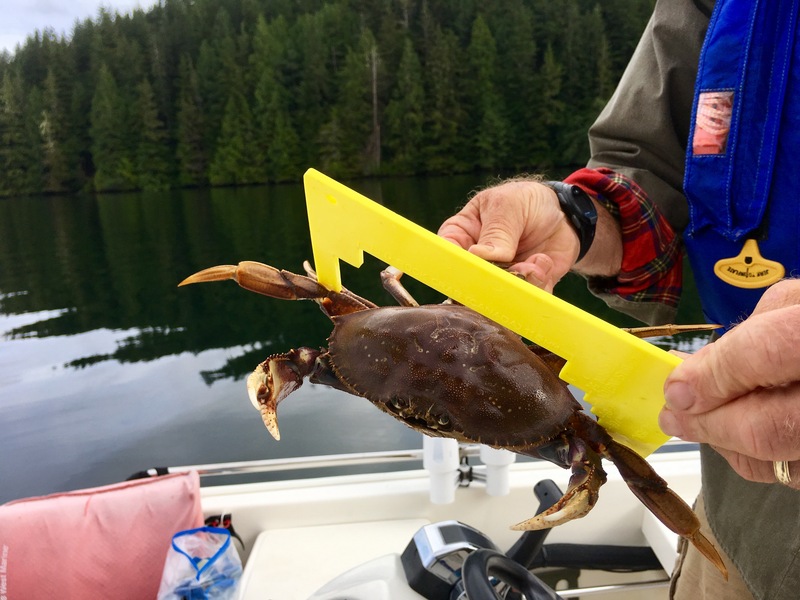 One trap had two dungenness keepers and one good size rock crab. The shrimp and crab combined make for a nice meal. We will keep searching for the jackpot. This entry was posted on August 31, 2017 at 3:49 am. You can follow any responses to this entry through the RSS 2.0 feed. You can leave a response, or trackback from your own site.